The Model KF 200 is compatible with nearly all existing portable systems. Memory download capabilities greatly increase the speed of reading temperatures. No hand written logs, eliminates the chance of transcription errors. 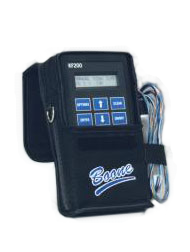 Automatic OHM/Resistance reading feature allows for fast and easy evaluation of your system's temperature cables and leadwire. Automatic download printing to your parallel printer for hard copy record. As an option download the KF 200 to PC for text and graphic displays of temperature and resistances. Stores and prints five readings to compare and monitor temperature trends. Available with 6 TC, 12 TC, 18 TC, or 21 TC jackhandles. Jackhandle adaptors available for different size plugs. Battery charger and long life battery pack included. Power circuit is designed to provide for extended use as with large systems. This helps to eliminate the need to recharge before all cables are read.